Hey it's a beer review. This is Vergina a Greek pale lager from Macedonian Thrace Brewery in Komotini, Greece. A subtle lager with light hoppy flavor and a hint of malt. The negative about this beer is that it also has a mild metallic flavor. 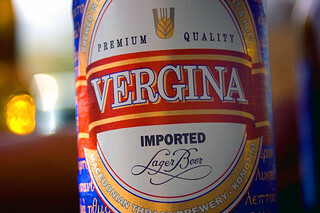 Overall, Vergina is a pleasant beer.